The tower of the church of St John the Baptist at Chilcompton, just a few yards from Midsomer Quilting. The carved stone screen in the upper window is particularly interesting. Rusty red, shrivelled and scabby. If this were a cat's fur it would mean an urgent trip to the vet. Instead it meant a trip to town today to buy some synthetic fur to repair my daughter's new jacket. It all started with a quiet drink in the pub, which is just a few yards from our house. Cabin fever had been getting to us, so the three of us, my husband, daughter and I, went out for an hour or so two nights ago. When we came back she noticed the damage to the fur trim around the hood of her jacket. At first she thought there was something stuck to it, then we worked out that it was heat damage. I thought that perhaps the fur had come into contact with an overheated fairy light on the windowsill behind her. She went dashing back to the pub to speak to the staff. It turned out that someone had left a lighted candle on the windowsill behind the bench we had been sitting on. In the circumstances I was grateful that her hood, or, worse still, her hair hadn't gone up in flames. My daughter was very phlegmatic about the whole thing, and said she wasn't worried about the damage, she would still wear the jacket with the trim attached. I insisted that it looked totally awful and promised to fix it. I was not looking forward to the repair job. Fur fabric was a step into the unknown for me. Fortunately, because the trim is detachable, I was able to unpick the damaged fur from its backing, then sew the backing to the new fabric. It is now attached to the hood and the jacket looks as good as new again. And my daughter is delighted, which for me, is the most important thing. With his harp and spear - another beautiful stained glass window in the chapel at Tyntesfield. Do you ever feel you have left Christmas preparations too late? Here is a brilliant idea. Make one quilt a month, and in December you will have a complete set of the Twelve Days of Christmas. 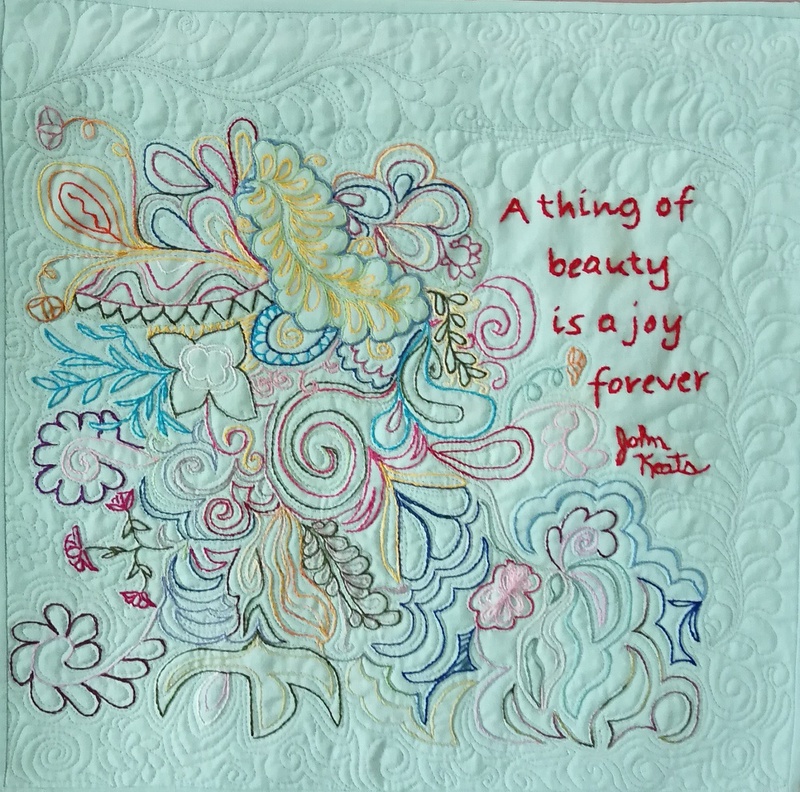 Last Friday I took a trip out to Midsomer Quilting to see their annual 12 x 12 show. 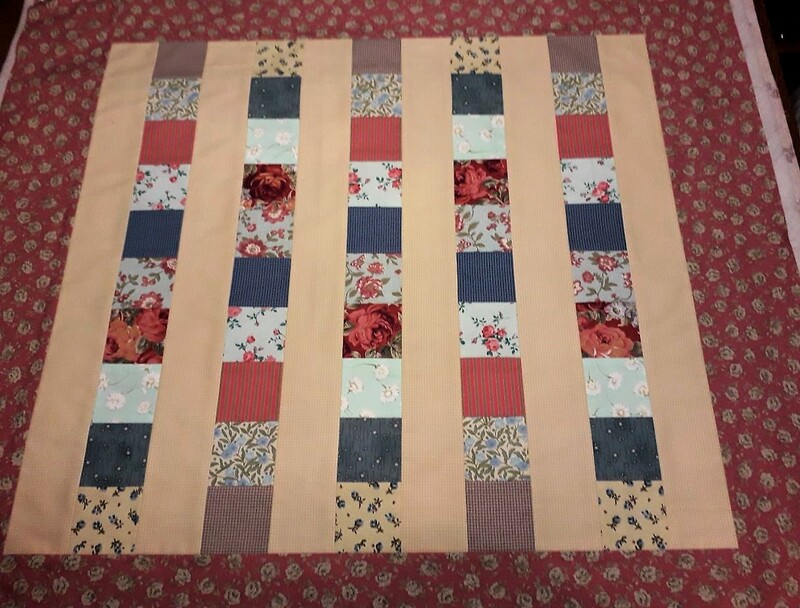 This ensemble of twelve 12 x 12 quilts, linked together with metal rings, was made by Claire Passmore. Classes are being planned so Claire can pass on her skills and get people started on their own versions of these 12 x 12s in plenty of time for Christmas next year. I thought the quilt for the eighth day with the smiling milkmaid was particularly delightful. The yellow plaits are so pretty. This quilt is by Marion Robinson, showing the seven swans a-swimming of the seventh day of Christmas. The swans in the foreground are adorned with real swans' feathers, which Marion found by the moat around the Bishop's Palace at Wells. This quilt is by Angela Knapp, showing a murmuration of starlings swirling through the sky. The theme of this year's show was "Think of a Number", and Angela's solution was ingenious. She specialises in stitched pictures of birds, and this quilt of starlings in the Somerset landscape is a real beauty. 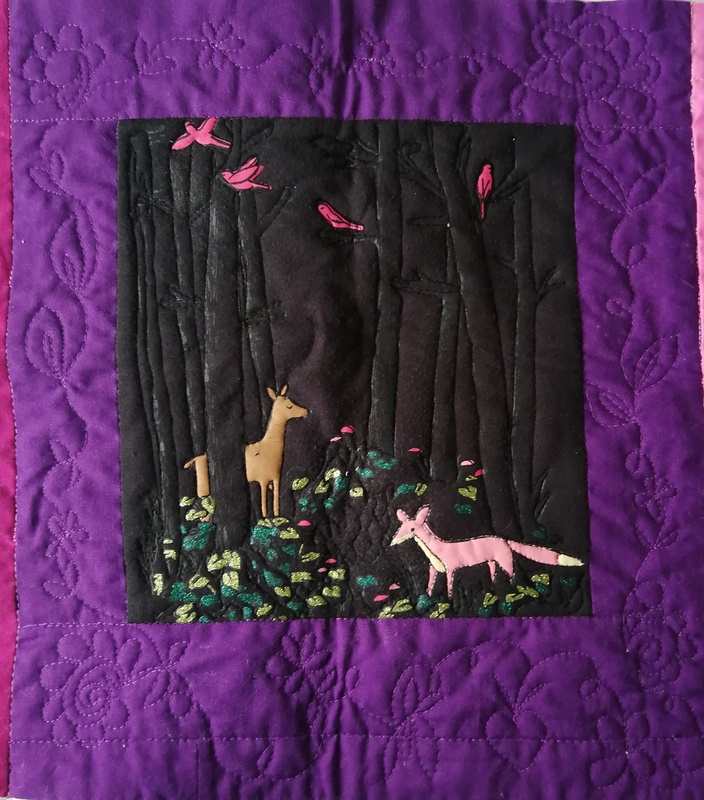 This quilt by Irene Burgoyne is a riddle. I failed miserably, had to read the description, and then felt really dense. But is it The Thirty Nine steps, the novel by John Buchan, or The 39 Steps, the Alfred Hitchcock thriller, or both? Irene has kept us guessing by putting the Roman numerals XXXIX in the top corner. Debbie Hart made this wonderful quilt of a well known front door. I dread to think how many times I have seen 10 Downing Street on TV or in newspapers, and I have never noticed the lamp. The detail is amazing, even down to the shape of the boot scrapers. Now time for tea and cakes. Tea for Two is by Sue Daniels. I love the dainty blue and white floral fabric that Sue chose for the china. Liz Turner also went for blue and white, but a slightly different theme. I didn't realise that a 20th wedding anniversary is known as a China Wedding. Nor did I know that a 9th anniversary is a Pottery Wedding. This fabulous 3D quilt by Hilary Timms not only has stuffed felt vases, but also tiny pots made of fired glazed clay. Valerie Cole's quilt, Nine Patch, was an instant favourite for me - not just for the sewing machine, but for every little detail. The tape measure and scissors are absolutely minute. This quilt, with the title "I Saw Three Ships" is by Brenda Rowe. The combination of colour, composition and clarity of line makes this picture stand out across the room, and when viewed up close you can appreciate wonderfully neat stitching and attention to detail. These three good time gals are waiting for the number 173 bus for a night out in Bath. This hilariously true to life quilt is by Lynne Clement. I wish I had seen Lynne at the exhibition. I would have been quizzing her as to whether her quilt is autobiographical. Finally, the prize for making my husband laugh goes to Salma Daniel, who made "Two Fat Ladies". Truly priceless. The longer you stare at it the funnier it gets. This is just a glimpse at a few of the quilts on show. There are over two hundred quilts in the exhibition, which is open every day until the 22nd December. Most of the quilts are for sale by auction to raise funds for Dorothy House Hospice Care. If you have the chance to visit, do so - it is an excellent exhibition in support of a very worthwhile cause. A small panel in a much larger window in the chapel at Tyntesfield. I had a trip there last Monday with my brother and sister in law. The conditions were just right for taking pictures of the windows. I had never seen biblical scenes depicted in the style of classical friezes before. The chariot was particularly striking. Making sandwiches again... but definitely not with spam. 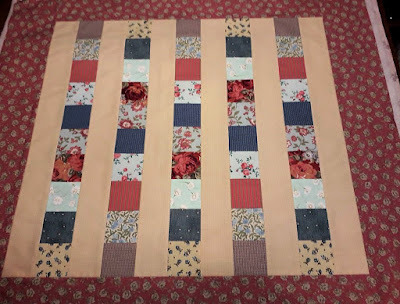 I have made two this week, to add to my pile of cradle quilts to be quilted. I rather like this one, with lots of pinks and florals, with a definite emphasis on roses. The colours look a bit sludgy in the photo because it was taken in electric light. 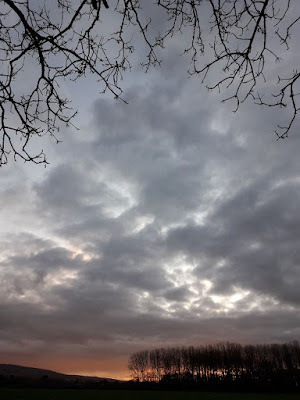 Today is particularly dull and rainy, and now that it is going dark by 4.30 the urge to hibernate is getting stronger by the day. 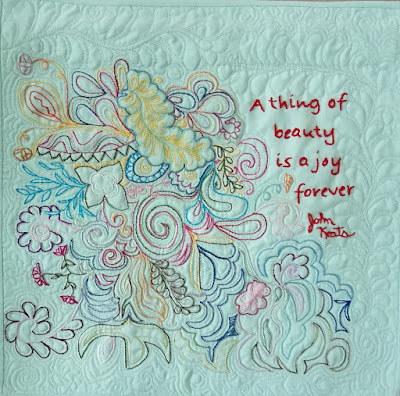 Although I am not feeling particularly creative on the quilting front at the moment, I have plenty to look forward to, with a trip to the annual 12 x 12 exhibition at Midsomer Quilting tomorrow. It promises to be interesting! As for spam, am I the only one feeling inundated by spam comments at the moment? I have got into the habit of not looking at my comments box for days at a time because I know I will see the same old rubbish time and time again. I cleared out 22 spam comments today, most of which were in execrable English, but there was a fair smattering of offerings in Portuguese from Brazil. It is so tedious. Enough moaning. It's linky time. Many thanks again to Andrée for linking up last time with her T shirt quilt. 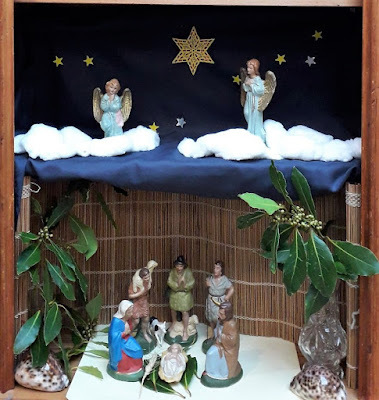 If you haven't seen her blog post yet, nip over now and see more. 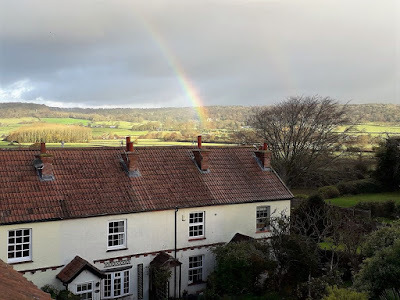 Every time I see a rainbow I make the most of it - either by gazing at it, or, if the camera is handy, seeing if I can get a decent photo. In this case I grabbed my mobile phone and dashed up two flights of stairs to hang out of the attic window. It is definitely the best view to be had from our house, and probably the most memorable photo from there since a balloon passed by. Big event! I got round to making a quilt sandwich today. I took advantage of a spare half hour and sandwiched one of the cradle quilt tops that I made recently. Will I manage to quilt it before Christmas? Perhaps not. Life has been busy recently, with a friend visiting from Germany, who has been with us for ten days and is leaving today, and my brother and sister lined up to stay with us this weekend. As you can imagine, the emphasis at the moment is on chatting and cooking. 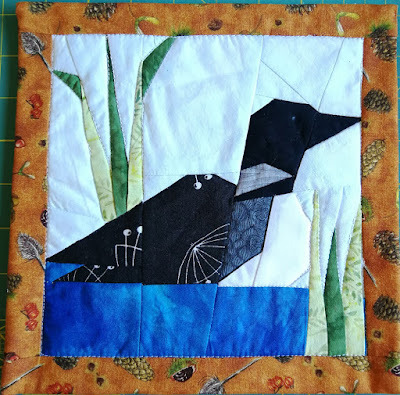 Many thanks again to Andrée for linking up last time with her paper pieced loon quilt. If you haven't seen her blog post yet, nip over now and see more. You might not be too keen on grey November skies, but every now and then there is a brief glimmer of colour. After putting off tidying the sewing room for weeks, I am finally getting round to it. Rather more than just a quick tidy is needed, more like a full stocktake. These are the backing material for cot quilts, some of which are offcuts from completed quilts and could well end up as tea cosies. Most of these lengths haven't been cut into yet. The timing of this sort out should set me up well for the New year. If I am reasonably organised by then I should be able to launch into some projects in January. I certainly won't need to go shopping. Just seeing what I have will start a few ideas. Now that Christmas is only a month away and I would really rather hibernate than be busy, sewing might recede into the background while I concentrate on knitting, which has the huge advantage of being something you can combine with slobbing around on the settee in front of the telly. And when I get bored of knitting I can make some mincemeat and look forward to home-made mince pies. Many thanks again to Andrée for linking up last time with her dolphins quilt. If you haven't seen her blog post yet, nip over now and see more.